A Day of Mourning for the Welfare State, Justice and Equality has been arranged to co-incide with the royal wedding on Friday 29th April, 2011 at 1400 hrs. This is just one of the expressions of outrage being expressed by people effected by the cuts to education, housing, public transport, the NHS, the Welfare State and much more. Whilst bankers and speculators celebrate another year of profit and Tory and LibDem politicians congratulate themselves on having continued to fool the vast majority of the public, students and school children, teachers and lecturers, trades unionists, disabled activists, mums and dads, grandparents, NHS staff, public transport workers, Local Government workers, etc., all continue to unite their voices in protest. 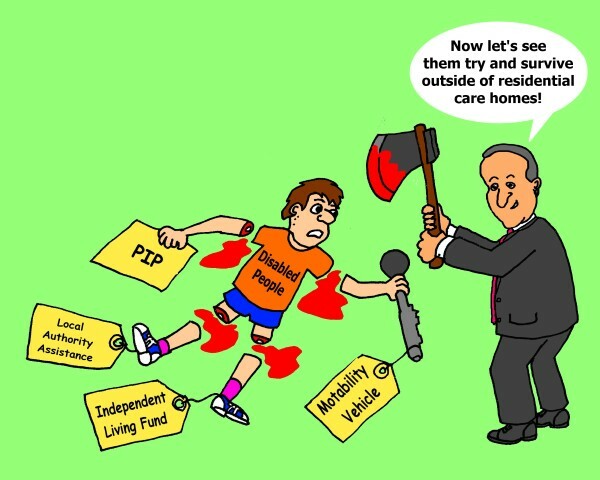 Disabled people are also taking to the streets like never before, fighting back against the claims that they are responsible for the state that the country is in by fraudulantly claiming benefits that they are not entitled to. Scapegoated once again by a government determined to distract people away from where the blame really lies. Which is why they view this royal wedding as such a good thing - more televised opiate for the masses! Regular Crips, who used to look at Disabled activists as a different species altogether are now joining with us to protest against the unfairness of the government's slash and burn tactics. We need this new energy that these newcomers are bringing to the fight. Many of us, having been protesting and fighting for Civil Rights for more years than we care to remember welcome this infusion of new blood. Unfortunately though, not all protesters see things this way. 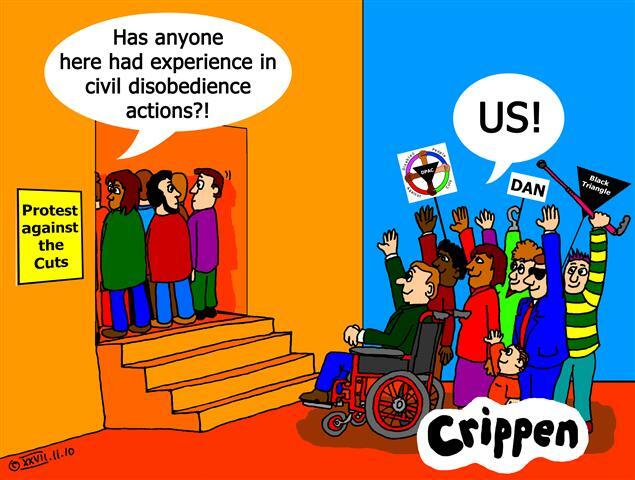 Although united in their stand against the ConDem's devisive policies, many non-disabled protesters still don't understand that Disabled people have just as much right to protest as they do. This has manifested itself in inaccessible venues being chosen for protest meetings, no provision being made to allow us to transcribe information into alternative formats, no accessible transport being arranged to travel with others to different areas of the country, etc. If anything, we have more right to be on the front lines of this current period of protest. We've been the ones, albeit not receiving much coverage in the press, who have been fighting consistently against oppression in these forms since the first World War. We are the one's who, having amassed a great deal of knowledge around civil disobedience campaigns can bring a whole wealth of experience to this current fight. We're not asking for 'special' allowances to be made, just that our right to protest with other members of society is acknowledged. Because, let's face it, this is basically what we're all protesting about anyway - the right for everyone to be treated equally, regardless of gender, sexual orientation, impairment, age or ethnicity and with full access to education, housing, health care, employment and retirement without a few fat cats siphoning off all the cream! To all of you non-disabled protesters out there, look upon Disabled people as a resource, rich in experience and networked into thousands of other Crips all around the world. Together we can change society into a fairer, more equal place to live. 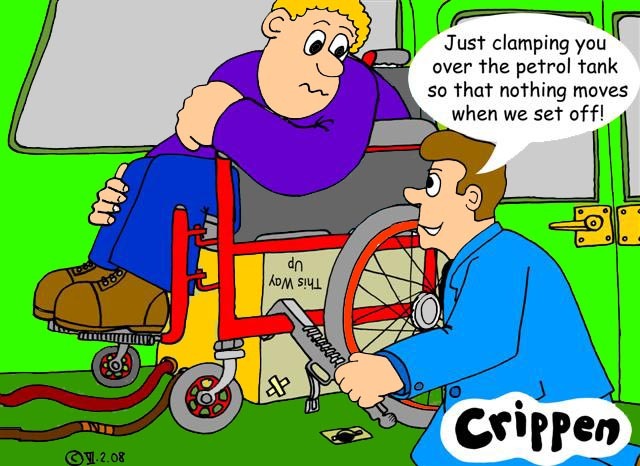 Our old friend George is carrying a useful piece of advice in his current blogspot which relates to the sorts of underhand techniques that some sales persons resort to when selling to Disabled people. Having worked in the dim and distant past for Motability in Harlow and then as a mobility consultant for several vehicle converters I can verify that many of these companies are only focussed on one thing - to get you to part with your money. I doubt that the standards have improved very much but I can remember one company that literally tested new products on their unsuspecting customers and then washing their hands of any responsibility when vehicles inevitably fell apart or failed to provide the access that they were supposed to. I even supported one customer in court when we discovered that her American vehicle, which had been converted to RH drive in this country by a bunch of cowboy access converters actually caught fire, trapping her in the automatic wheelchair clamps as the electrical circuits burned out around her. Very scary stuff, especially when her only means of access, the automatic wheelchair ramp also failed to work! Many of the companies who converted vehicles for wheelchair users, whether as drivers or as passengers, failed to alert their clients to the fact that by cutting away significant areas of the base vehicle, moving the fuel tank (and sometimes fabricating a replacement tank of their own), this invalidated the base vehicle warranty. Let's face it. Are the Ford Motor Company going to stand by their safety warranty when the integral strength of the vehicle has been compromised and replacement petrol tank has been installed in the wall alongside of the rear wheelchair passenger? The original petrol tanks are subjected to every test possible, including crash testing, whereas the replacement tanks, made to an inferior design and of an inferior material could only be 'crash' tested by the customer! Hopefully the rogue converters have all been rooted out and the reputable companies are the only one's allowed to convert vehicles for wheelchair users now.